This week we’re giving away a luxurious, eco-friendly Cherish Organic Gift Set from BABYBEARSHOP! Included in this trio of BABYBEARSHOP treasures is: an 8oz bottle of Organic Mama Belly Oil ®, which is ideal for a pregnant mama’s blossoming belly! This all-natural, non-greasy formula is easily absorbed into the skin and helps keep stretchmarks at bay. It may also be poured into the bathtub as a relaxing elixir which softens and soothes skin. A 4oz jar of 99% Organic Cheeky Baby Butter®, a nutrient rich Shea butter baby creme that may be applied to baby’s dry skin or chapped cheeks, or used to give baby a skin hydrating massage. And an organic cotton grape toy baby may cuddle or use as a teether! BABYBEARSHOP is a purely organic skincare line founded by a mother of two who wanted all natural, eco-conscious body care products for her children. BABYBEARSHOP products are made in the USA from nourishing plants and plant extracts derived from organic sustainable farming methods, and they are 100% cruelty free and packaged in recyclable containers. As important as what is in BABYBEARSHOP products, is what they are free of: NO parabens, phenoxyethanol, lactoperoxidase, citrus seed extract and no other synthetic preservatives or additives. They contain no dairy, no nuts, no gluten, no soy, no egg, no oat, no colors, no artificial anything. Read more about our love for BABYBEARSHOP products in our feature, and then enter to win after the jump! 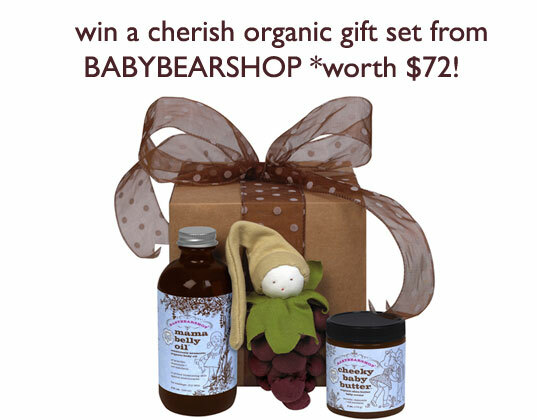 ENTER TO WIN BABYBEARSHOP’S CHERISH ORGANIC GIFT SET! 1) Sign up for our weekly newsletter (if you haven’t already!) We’ll be notifying the winner in our newsletter – so you need to sign up and receive next week’s newsletter to find out if you have won the Cherish Organic Gift Set from BABYBEARSHOP! Can’t wait to win the Cherish Organic Gift Set? Shop now at BABYBEARSHOP and with each order of $40 or more, enter promo code “MyInhabitot” to get a free All the Better to Kiss You With eco lip balm kit (a $17.99 value!) For every BABYBEARSHOP order that is placed, they plant a tree to offset carbon emissions. Click here to help support BABYBEARSHOP in their quest for a small business grant! Contest ends Sunday, February 28, 2010 at 12 midnight EST. Winner will be announced in next week’s newsletter! It seems that every week I have a new memory to most cherish with my baby. SInce she has learned to use her walker my best memory now is walking in the door and having her see me, smile so big, and run right for me that first time. I, sadly, do not have any children yet. However, I still would like to enter the contest, if that is all right, and share my mother's answer to your question. She stated the following: "There really wasn't a major event. It was the little things like watching you & your brother & sister get so excited over the tiniest thing. Coming home from the grocery store and showing you some new popsicle I bought would get you all so excited! What I think I cherished the most though, were the times I would watch you all working together for a greater goal. When your brother convinced you and Jill (my sister) to help him clean off that dirt bike to go riding, and you actually went out and did it, I was shocked. I remember peering out the living room window with the camera to take a picture of my three babies scrubbing down that dirt bike all filthy and soapy together, as my little tribe. It was moments like that that melted my heart." I remember doing that, my brother was very convincing and I actually have a copy of that picture on my computer. If you want to see, I uploaded it here: http://www.icemoonstudios.com/jilldylanjoaniedirtbike.jpg I thought her answer was cute, so I thought I would share. Thanks! While conception was pretty fun :) I am very excited about my little girl entering the world. For her brother it would be seeing him quietly learning how to fish with my father, I am very close to my father so seeing them bond like this was heart melting. There's a lot of answers I could give for this -- from hearing him belly laugh to breastfeeding -- but here's the first thing that comes to mind: There's nothing more peaceful than having an infant snuggle into your neck and fade away to sleep. The way he stares up into my eyes, stroking my face, and I know he knows everything is okay when he's with me. He's safe and comfortable -- the only place he wants to be. And as I rock him, I can feel his breath deepen and slow, his tiny eyelids flutter closed, and he melts into me -- so peaceful. I think I'll cherish MOST the four short months that we co-slept, where I could feel and see that every night, all night. But even now, just holding his sleeping body is what I'll remember and cling to when he's older and angsty -- wiping away my kisses, pushing away for his independence. I'll remember how there was a time that my touch was enough to make everything right and how he didn't want to let me go. We're still early in our first trimester, but every day is a new adventure. Each week I can't wait to read the emails I get telling me how big our little one is and how much she or he will grow in the coming days. I'm so excited to be on this journey and to expirience every moment of it. Still waiting to hatch, but waiting for all those "moments" - 1st kick, birth, 1st bath, etc. Its our first so I think everything will be cherished! Reading time in the evening. The babes is only 7 weeks old, but she's already enjoying curling up at night with a good book (and her parents). I cherish the times when my daughter sings and makes up wonderful songs. I'm not a singer so it makes my entire body smile to listen to her beautiful melodies and sweet rhymes. Last night it was about how much she loves me because without me she wouldn't soon be getting that baby brother she always wanted! Every moment. Each and every day is a blessing and watching them grow and learn is amazing! The moment when my daughter hugged me, a real hug, for the first time...what a feeling! The first time he figured out how to sit himself up all by himself, and then he looked at me and laughed with delight. The two of us sat on the floor and laughed and giggled at his little achievement for a good five minutes. It was amazing. Lots of cherished moments. One i will never forget though...i was nursing my daughter, when she pulled off the breast, looked up at me and said 'Thank you mama' then went back to nursing. My heart completely melted. Wow - what a tough question. I'd say one of the most memorable moments for me was the first time my little man ran to see me, arms open and with a huge smile. Moments like those really are all about pure love! I am 38 weeks pregnant with our first child. So my most cherished memory is when around 20 weeks or so I was feeling totally down. As normally with pregnancy I was clumsy and forgetful and that caused me trouble at work with my manager. I felt a failure and not sure how would I go on at work with my crippled memory. I was crying on an empty office asking for guidance when my baby girl started kicking me hard like saying to me: You are not alone, I am here with you and everything will be alright. She was telling me that all that clumsiness, bad memory, and whatever else pregnancy would bring was worthwhile because of her and I know it will be. I also subscribed to your weekly newsletter! Thank you! The fist time my daughter laughed :) I remember thinking it was the most beautiful sound I had ever heard! So hard to choose a most cherished moment! Prenatally it was when we first saw our baby at 6.5 weeks gestation and could see the teeny tiny heart beating. I was crying so much the technician had to tell me to stop crying so she could see what was going on in there! Now, I love to hear him call me "mama". At 34 weeks, I'd say it was the first ultrasound. Such a cutie! Plus my husband cried, because I guess it's not real to men 'til they see it! (And he's a softy) Before the that he was still kind of eek kids eek they're so expensive blahblahblah. I think the most memorable (although it is among many such moments) is happening these days as he drags a chair around the kitchen to help us do whatever we're doing (dishes, cooking, baking, etc). In the kitchen he's never without a chair to push here and there. But we're just waiting for the new baby (due any day now) to have many more memorable moments with too! My baby isn't born yet, but the best moment so far was when my partner was first able to feel baby move. I had been feeling movement for some time, but being able to share that with him made it that much more real that we were having a baby. I cherish each morning when my son wakes up and cries out "mama." We go and sit on the couch with a bottle and snuggle up for a little while before he jumps up and is ready to play. This is our quiet time together since I only get to see him about two hours a day. Every moment is precious when you have a child. I am absolutely in love with my little man and can't imagine a day without him. I cherish each moment but love it when I go in the morning to wake up my 2 year old and he awakes with a new comment each day....me ride bike, or abacado or me read boooook or basketball or soccor ball! Endless joy and entertainment! My first-born is now a papa himself; Kallie, my granddaughter, will be one year old in March, but I haven't been able to see her yet. That first meeting *will* be one of the most precious, cherished moments of my life...holding my granddaughter while hugging my son. For me, that moment is when she wakes up in her crib, looks around and says "mama". Having her finally associate the word with me, and use it to call for me is really special. I'm due in 2 weeks but what I've cherished during my pregnancy is when my baby plays footsie with its daddy. When our kid pushes his hand/foot/elbow/knee out, my husband will talk to it and push back and wait for something to to pop out somewhere else. I've cherished each of my girl's births. There is something amazing and miraculous about a birth and I absolutely will cherish that in my heart until the day I die. I cherish each of my girl's births. There is just something incredibly miraculous about the birth of a child. From the first breath they take, to the first time they look you in the eye and see that you are mama. Absolutely amazing and will cherish it forever! There are so many but the best for me must be when my daughter was about 6-7 months old I guess. She and I were across the room from each other and looked at each other and just started a giggle fest while staring into each others eyes. Pure Joy! The morning after my son's birth I woke up in the labour ward. I immediately knew something was missing. For 9 months I had him with me & now where was he? It was an overwelming sense of maternal yearning & then they brought tea & toast before they brought my son. I will never forget the feeling of being so totally responsible for someone else. Subscriber! What event/moment in your child�s life thus far do you most �cherish? It's always when they are sleeping and they look so angelic....I can watch them for hours that way. It was the first giggle. We live overseas away from our family and were back home to introduce our son to his relatives. One morning we were all in bed together having a chat and my two nieces came padding up the stairs and peaked their heads round the door. They came in and stood at the bed so that they were eye height to our baby boy. They were talking and cooing to him and then out of no where he began to laugh, for the first time, it was a great big belly laugh that went on an on. We all giggled. My partner and I still talk about it months later. Priceless. I cherish the first ultrasound confirming that we were expecting! My baby isn't part of the outside world yet, but I cherish the moments I eat great foods to help my baby grow healthy. Every time I eat an avocado or drink what seems like my 100th bottle of water, I cherish the health I am giving my growing little baby. This week we're giving away a luxurious, eco-friendly Cherish Organic Gift Set from BABYBEARSHOP! Included in this trio of BABYBEARSHOP treasures is: an 8oz bottle of Organic Mama Belly Oil �, which is ideal for a pregnant mama's blossoming belly! This all-natural, non-greasy formula is easily absorbed into the skin and helps keep stretchmarks at bay. It may also be poured into the bathtub as a relaxing elixir which softens and soothes skin. A 4oz jar of 99% Organic Cheeky Baby Butter�, a nutrient rich Shea butter baby creme that may be applied to baby's dry skin or chapped cheeks, or used to give baby a skin hydrating massage. And an organic cotton grape toy baby may cuddle or use as a teether! BABYBEARSHOP is a purely organic skincare line founded by a mother of two who wanted all natural, eco-conscious body care products for her children. BABYBEARSHOP products are made in the USA from nourishing plants and plant extracts derived from organic sustainable farming methods, and they are 100% cruelty free and packaged in recyclable containers. As important as what is in BABYBEARSHOP products, is what they are free of: NO parabens, phenoxyethanol, lactoperoxidase, citrus seed extract and no other synthetic preservatives or additives. They contain no dairy, no nuts, no gluten, no soy, no egg, no oat, no colors, no artificial anything. Read more about our love for BABYBEARSHOP products in our feature, and then enter to win after the jump!